On Sunday 19th November I participated in my sixth Philadelphia Marathon. I have come quite a way since my very first marathon also in Philadelphia in 2011. This race would take my total number of marathons to 19 setting the stage for number 20 in January at Walt Disney World. Trying not to get ahead of myself though, I’d like to focus on my experience for this race. Last year the running of the Philadelphia Marathon transferred hands from the City of Philadelphia to the race team that hosts the Broad Street Run. They made some changes to the weekend, some welcomed and some less so. One of the changes was to split the half and the full races into separate days and different courses. They also created a challenge event for those that participated in both races, the ‘Rocky Challenge’. If you follow my recap from last year you can read how that unfolded. This year the race organizers announced the challenge (rebranded the ‘Liberty Bell Challenge’) at the time of registration. 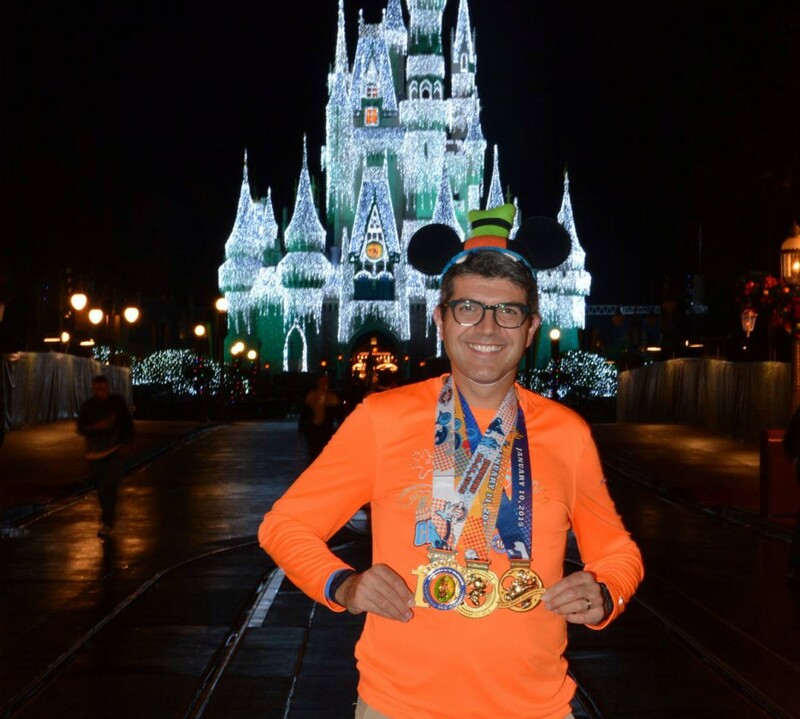 Seeing as I will be running a 39.3 mile event at Walt Disney World in January I decided that I would focus on just the marathon this time around. I do occasionally need to get some sleep. As always, I was getting excited prior to race day as I followed my friends running the Chicago Marathon, the Marine Corps Marathon and the New York City Marathon in the weeks leading up to Philly. I was just waiting for it to be my turn. Soon enough though the weekend rolled around. I visited the expo on Friday evening. It was again held at the Philadelphia Convention Center in Center City. Packet pickup was fairly straight forward. I was only doing the marathon this year but it looked like they were pretty organized for the challenge runners unlike last year when no one seemed to know what I was talking about. Once I had finished meeting Bill (he’s a talker 🙂 ) I headed over to the expo and to the race merchandise area. As per prior year it was well stocked and divided up into men’s and women’s sections. I made my purchase of a puffer vest that I had looked at the prior year and passed on and also a new beanie. I was happy with my purchases but even happier about the bag that they provided for my new gear. Okay, maybe I get too excited by race expos but I thought that if they are going to take the time to provide logo bags then they might enhance the running experience on the day. We shall see. At the expo they had the Lexus pace car on display. It was covered with the names of all the runners. This was not an alphabetical list so after a few minutes of looking for my name I gave up. I’m sure it was somewhere on there. Why would it not be alphabetical???? I didn’t make any major purchases at the expo…unless you count registering for another marathon. Yup, I’m now registered for the 2018 Delaware Marathon in late April. I had my eye on this as I can drive there on the day and I was looking for a spring race. They were offering a discount so I went for it. Looks like another winter training plan for me. With no other merchandise jumping out at me and no other needs or accessories that were required I headed home for an early night and hopefully a restful weekend. What was planned to be a restful day came to a grinding halt early Saturday afternoon. While I was driving the family to the car dealership so my wife could do some test drives, I had a major cramp in my left calf. It came from nowhere and was extremely painful. I couldn’t walk for a good amount of time and I was seriously concerned. I reached out to my runner friends for advice and they all told me to hydrate. I started pounding water for the next couple of hours to which came the next bit of advice…don’t drink just water, electrolytes…you need electrolytes. So at this point I was heading home and started taking salt tabs every 30 minutes or so as I tried to massage out my calf. Then I was told to take an Epsom salt bath which I did and followed that up with a hot shower. Next up, icy hot applied to the area and then a calf sleeve. Desperate….you betcha!!!! Well, with nothing more that I could do I headed to bed. Hoping that the rain that had been coming down all afternoon would give way to some better weather (spoiler alert – it didn’t) and that I would get a good night’s sleep so that I would wake up rested, relaxed and hopefully with a seemingly normal feeling calf muscle. My alarm went off around 4am. I started to get ready, very bleary eyed, listening to the wind and rain outside the window and feeling my calf muscle still sore and tight. I guess my goal time was out for the day. I headed downtown hoping to get to my regular parking lot before they started blocking off the roads and was able to make good time. It was still raining while I was driving down and also as I walked to the race staging area holding onto my rain poncho and praying it didn’t fly away. Thankfully as the morning started to break the rain stopped. There was still a very strong wind and it was cold but at least the rain had stopped. That was something. Unfortunately due to the amount of rain which had been falling steadily since Saturday afternoon the ground was saturated. It was pooled with water and muddy in many areas. I met up with a colleague who was also running and we headed to bag check together. In past years (each of the 5 previous times I have run this race) bag check is in Eakin’s Oval itself on the paved area. This year they had moved it off to the side of Eakins Oval. While the trucks were on the street you could only access this by walking across the grass…which happened to be almost ankle deep with wet mud in places. Another annoying aspect of the bag check was that it wasn’t sorted by bib number nor alphabetically, it was a first come first served process. Everyone went to the first truck they saw which was out of the way of the soggy ground. This became a mad crowd surge as people started hearing the National Anthem being sung. We had only a few minutes to get to our corrals before our waves went off and people were still queueing up to check their bags. Crazy. What a mess. I ended up with a tag from truck 2 and my bag was put on truck 3. I’d have to hope that they sorted the bags out before I got back at the end of the race. The race had already started before I made it to my corral but my corral had not yet been released. It was a mad dash but I made it. Talk about an adrenaline rush. It was crazy. Although the rain had cleared it was still cloudy. The temperatures were in the high 40s but with winds of 25mph+ and gusting well above that the temperatures felt much colder. Once my corral was released and we were underway I kept up with the pack of runners around me. I had set my goal time to sub 3:50 hours and a secondary goal of 4:00 hours. This meant running a pace in the mid 8:30 minutes/mile. As we were running down towards Delaware Avenue (around mile 2) a gust of wind blew as we passed by a gap in the buildings and everyone moved sideways. Wow. It was strong. I was able to maintain a pace between 8:25-8:30 minutes/mile for the first 7 miles or so despite the headwind but as I ran towards Chestnut Street around the old city I felt my calf tweak again and I knew at that time I would have to back off or at least do something different. I had not been doing any run/walk intervals during races since running the Mohwak Hudson Marathon back in 2016. With the sudden jolt to my left calf I decided to minimize any pain/damage and go back to my old intervals. My Garmin watch still had alerts as I had never turned them off so I just settled into a 4:00/0:30 minutes/mile run/walk ratio so that I could keep my momentum going. This slowed my pace a little but not considerably so I was able to keep moving at a decent pace. My sub 3:50 may be out of reach but I felt good for a sub 4:00 hour (or close to it). Running up Chestnut Street towards Drexel University was like a 2 mile wind tunnel. All around me people were losing hats/visors. I tightened my hat on my head and just pushed into the wind waiting for a break when we turned the corner up towards Fairmount Park. The wind was pretty brutal. The sun was out though so it was still an enjoyable run. The crowds were out to cheer despite the cold and the wind. That is one of the best things about the Philadelphia Marathon. The crowd support for the first 10 miles is great. It thins out a lot in Fairmount Park until you get back to the Art Museum around mile 14 and then thins again until you hit Manyunk. Still, the crowds are one factor in this race that keeps me coming back again and again. The run through Fairmount Park was fine (once you get beyond the big hill up to Memorial Hall) and I’m glad we get to spend more time in the park so that we can avoid the old out and back that used to be around mile 17. This however prevents you from hitting the half way mark at the Art Museum as used to be the case when the Half and Full marathon was run on the same day. We hit the Art Museum around mile 14 since they changed the course and I was there just in time to see the race leaders making their way up the finish line. Yup, they were 12 full miles ahead of me…and running in singlets in this weather. The slog…sorry, run…up to Manyunk along Kelly Drive is scenic but into wind is just tough. Very tough. There is no shelter from the wind the whole time you are running. The course is fairly flat but it felt like you were running up hill all the way as the wind was just relentless. Some of my friends behind me took pictures next to trees that had been snapped in the wind. Yes, I’m not exaggerating that the wind was strong. At least when we entered Manyunk we were sheltered from the wind by the buildings. This also made it much warmer for those miles. The run through Manyunk is an out and back from mile 19 to 21. There is a slight uphill but with a break from the wind this didn’t seem too bad. I was slowing a little though. My pace had fallen off while running miles 14 to 19 into the head wind. I was probably not looking to make my 4:00 backup goal. My goal was to finish and do so with a smile. So, thinking that if you are running into wind you would have it on your back on the way in would make sense…neh, all of a sudden you get a cross wind on the way back from mile 21 to 26 (insert face palm emoji here…) The run back was steady. I was just looking to finish at this point. My legs were aching more than usual for a marathon. I can really describe conditions as though you were running uphill the whole way because the wind was honestly that strong on the day. I made it to the finish line in 4:08. Not my best time but again not my worst. I was very relieved to finish this one. As I was running the finisher chute there was a runner receiving emergency medical treatment just in front of the finish line. I saw someone go down just after they crossed the finish line. It was not an easy day. Still, marathon number 19 was in the books. I stopped for a large cup of hot coffee on my way home. I’d earned that for sure. Usually I’m pretty much up and about the afternoon of a marathon but I was cooked. I needed to rest up. I reviewed my running data and looked at my charts. Holy moly that was an effort today. My time in the highest heart rate zone was insane. 2:31 hours out of the 4:08 was almost at maximum effort. I wasn’t exaggerating when I said it was not an easy day. Interestingly enough, it took me a few extra days to recover from this race. I’m usually sore a day or two after a marathon but I was really struggling even by day 3. I finally was able to run properly just in time for our Thanksgiving Day run on the Thursday post race. I told my wife I may be taking a break from Philly after this year, after all, I’m running the 2018 New York City Marathon next November. That was until Black Friday when I signed both my wife and myself up for what will be the 25th anniversary running of the Philadelphia Marathon. I’m a sucker for a special medal.